TEHRAN (FNA)- The Trade Promotion Organization of Iran (TPOI) and China’s External Trade Development Council signed a memorandum of understanding to strengthen bilateral trade ties, a TPOI official said. TPOI Deputy Director Ali Hushmandi Manesh told MNA that the sides agreed on exchanging knowledge in economic and commercial fields, and swapping related publications and any information which can streamline two-way trade. 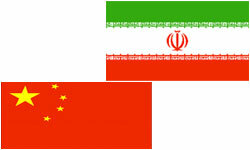 Iran’s foreign affairs and commerce ministers and the Chinese commerce minister were present at the signing ceremony.